Podcasting is the Andy Warhol of content marketing. During the 1950s and 1960s, Warhol created a unique story proposition by exploring the link between art and popular culture. His work was at the forefront of the visual and pop art scene because almost nobody else was doing what he did — and he made much of his best work freely available. Today, podcasting is the emerging platform for forward-thinking content marketers who want to take advantage of the power of audio. But just like other content marketing activities, to get the most from your audio content, it’s best to approach it as one important part of an overall content marketing strategy. Savvy content marketers repurpose successful pieces of content into other formats to extend their reach and attract new audiences. Smart podcasters do the same. Yesterday on Copyblogger, I shared interview best practices from top podcasters. 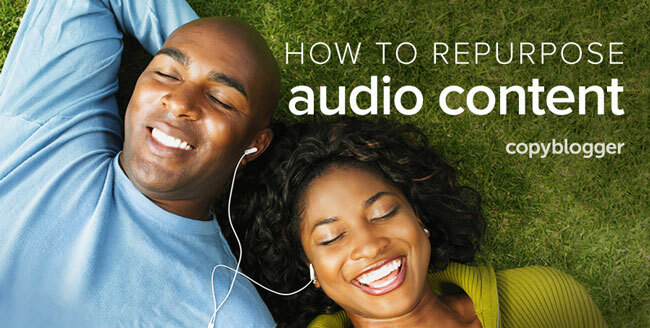 Now, here are six ways to use insightful audio content to enhance your other content marketing activities. One of the simplest ways you can repurpose your podcasts is to transcribe them and post the content on your website. These transcriptions will help more people find specific episodes of your show in search results. If you have the budget, you can outsource this task to a transcription service such as Kibin or Rev. Pat Flynn, host of the Smart Passive Income Podcast notes how transcripts of his shows provide extra, important value for his audience. Many nonfiction writers spend a significant amount of time interviewing people within their niche as part of research for a book. Research is an important part of the writing process, but it’s also time-consuming. If you are a podcaster, you can combine your podcast interviews with your book research. For example, Joanna Penn, host of The Creative Penn Podcast, includes content from her podcast episodes in her nonfiction books, such as Business for Authors. You can use the contents of a podcast to grow your email list. John Lee Dumas, host of EntrepreneurOnFire, has grown his business by repurposing podcast interviews for email opt-in giveaways. “Creating [email list] opt-in giveaways and blog posts that are round-up style … have both gotten some really incredible feedback from our audience — including a share by Tim Ferriss,” he said. Top 15 Business Books Recommended by Today’s Top Entrepreneurs is an example of his repurposed content. Copyblogger founder and CEO Brian Clark used a series of podcast episodes as part of two weeks of free online marketing training. John Lee Dumas also used this approach to create courses about podcasting and webinars, respectively. After you’ve finished a series of interviews, you might have plenty of raw content you can use as the foundation of an online course that you could complete with transcripts, images, webinars, and other supplementary materials. When an astute podcaster interviews a high-profile authority within his niche for a podcast episode, he uses portions of his interview to promote his show and add value to other content on his site. For example, you could mention the people you have interviewed on your About page or on a landing page. Matt Johnson, host of the Runner Academy Podcast, looks for opportunities to utilize podcast content as social proof. Joanna Penn has recorded more than 200 shows and has turned many of her podcast episodes into blog posts and YouTube clips. Jay Baer often turns one interview from the Social Pros Podcast into many different types of content that appear on various places online. Podcasting is a portable form of content that your customers and prospects can consume without having to spend their valuable time in front of a monitor, tablet, or screen. If getting in front of the microphone makes you uncomfortable, consider how podcasting could open up new doors for your business and develop connections that otherwise wouldn’t be possible. Building these connections in a public space will also help you deepen your bond with listeners and grow your business. With thoughtful planning and focused work, you can easily repurpose your podcasts into other forms of content that will help you grow your audience. If people ask why you’re venturing into podcasting, tell them Andy Warhol sent you. Editor’s note: If you found this article useful, make sure to also check out Beyond Chitchat: Here’s How to Extract Expert Knowledge From Your Next Interviewee by Bryan Collins.